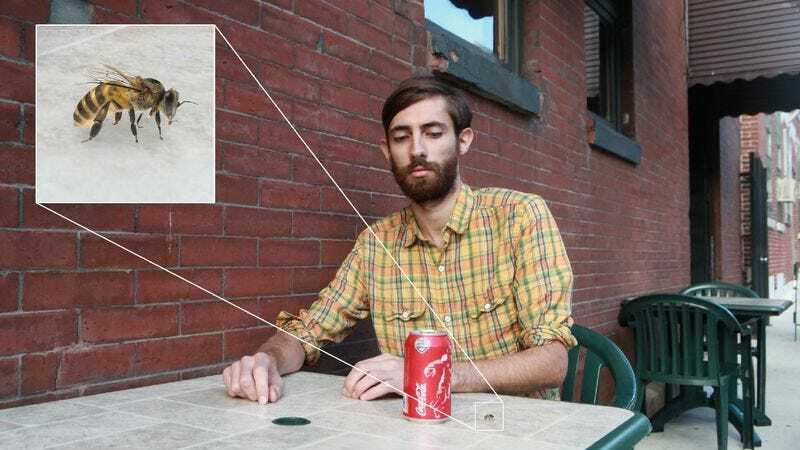 GREENWOOD, IN—With relations in the patio area approaching crisis levels for much of the past 15 minutes, sources within Cityside Grill’s outdoor dining space confirmed Thursday that an uneasy détente had finally developed between area man Kyle Silvestri and a honeybee. The tense calm, which reportedly arrived after the bee retreated to a safe distance on a nearby railing, came after a period of provocation that had lasted for most of the 31-year-old administrative clerk’s lunch. Observers said they witnessed open acts of aggression between the two factions, including the bee flying dangerously close to the contested territory of a Coke can and Silvestri once attempting to swat away the insect with a menu. However, experts with knowledge of the two sides’ historically strained relations were pessimistic about the truce’s staying power, noting that the bee was showing no signs of withdrawing from the terrace and emphasizing that Silvestri had repeatedly asserted his right to eat on the patio in peace. At press time, sources confirmed that the brief armistice had fallen apart after the bee suddenly entered the airspace around Silvestri’s head, prompting the man to surrender his territory and seek refuge indoors.